Is USPS Losing Money Because of a 2006 Pension Law? - Truth or Fiction? A debate continues over whether the United States Postal Service is losing money thanks to an arduous pension pre-funding law or if it is simply because mail volume is decreasing due to the influence and costs of newer technologies. The United States Postal Service (USPS) is losing money due to a 2006 law mandating it fund its pensions 75 years in advance. The Postal Service is not losing money because of Amazon. It’s losing money because in 2006, the Republican-led Congress passed a law forcing it to prepay its pensions for 75 years, which no other corporation does. This was meant to bankrupt it so it’s business could be privatized for profit. 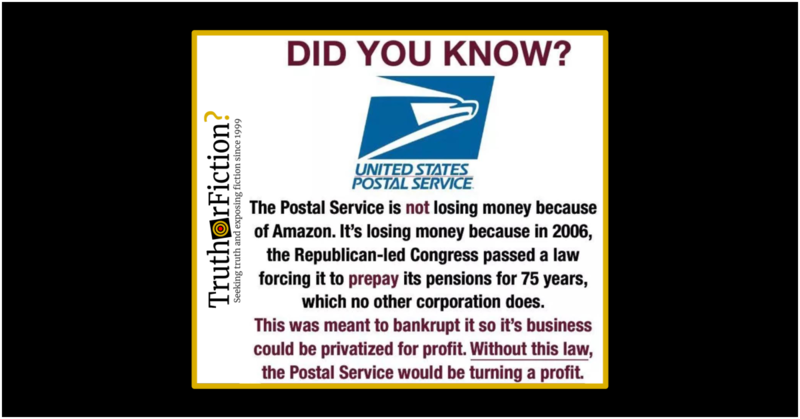 Without this law, the Postal Service would be turning a profit. Back in 2013 and 2014, the partnership between the USPS and Amazon.com made headlines as a potential saving grace for the struggling postal service. Amazon’s Prime membership rates were exploding — the primary benefit being free two-day shipping — and somebody needed to deliver these packages dependably and efficiently. The USPS was a natural ally due to its daily neighborhood canvassing, and the postal service even announced it would begin some Sunday deliveries for the first time in history — likely to please its new convenience-focused friend. Fast forward to August 2016, when the USPS released a sobering statistic: package revenues would have to increase 260% to make up for the losses in first-class profits. Package deliveries were more prevalent than ever, but their earnings still paled in comparison to that from first-class mail. But first-class revenue is on a landslide, of course. And delivering packages is significantly more expensive. At the time of Trump’s April 2018 tweets, the then-most recent fiscal year report from USPS indicated that revenues dropped $1.8 billion versus the previous year. In the interim, a 2018 report from USPS showed revenue was back up by a billion dollars. Requires the Postal Service, beginning in 2007, to compute the net present value of the future payments required and attributable to the service of Postal Service employees during the most recently ended fiscal year, along with a schedule if annual installments which provides for the liquidation of any liability or surplus by 2056. Directs the Postal Service, for each year, to pay into the above Fund such net present value and the annual installment due under the amortization schedule. Makes OPM actuarial computations subject to PRC review. Then there is the Postal Accountability and Enhancement Act of 2006 (PAEA), which some have taken to calling “the most insane law” ever passed by Congress. The law requires the Postal Service, which receives no taxpayer subsidies, to prefund its retirees’ health benefits up to the year 2056. This is a $5 billion per year cost; it is a requirement that no other entity, private or public, has to make. If that doesn’t meet the definition of insanity, I don’t know what does. Without this obligation, the Post Office actually turns a profit. Some have called this a “manufactured crisis.” It’s also significant that lots of companies benefit from a burden that makes the USPS less competitive; these same companies might also would benefit from full USPS privatization, a goal that has been pushed by several conservative think tanks for years. It requires the self-supporting U.S. Postal Service, which receives not one dime in taxpayer subsidies, to fully fund its retirees’ health benefits for 75 years into the future. It also requires that money be set aside over a 10-year period, at a rate of more than $5 billion per year. That means the postal service is now paying for the future health care of retirees it has not yet hired, and who in some cases have not yet been born. No other public or private company in the nation bears any kind of financial burden like that. As a result [of the PAEA], in 2007 USPS began prefunding its retiree health benefits as its [Civil Service Retirement System] CSRS pension liability was significantly reduced and its annual CSRS payment was suspended. USPS stated in its 2007 Annual Report that such prefunding was a farsighted and responsible action that placed USPS in the vanguard of both the public and private sectors in providing future security for its employees, and augured well for its long-term financial stability, but also acknowledged that the required payments would be a considerable financial challenge in the near term. We testified in April 2007 that we had removed USPS from our high-risk list due in part to USPS’s financial improvements resulting from these congressional actions. Contrary to statements made by some employee groups and other stakeholders, PAEA did not require USPS to prefund 75 years of retiree health benefits over a 10-year period. Rather, pursuant to OPM’s methodology, such payments would be projected to fund the liability over a period in excess of 50 years, from 2007 through 2056 and beyond (with rolling 15-year amortization periods after 2041). However, the payments required by PAEA were significantly “frontloaded,” with the fixed payment amounts in the first 10 years exceeding what actuarially determined amounts would have been using a 50-year amortization schedule. As the report noted, the period of pre-funding was “in excess of 50 years” and “significantly ‘frontloaded,'” creating the appearance of a massive debt not related to immediate operating costs and “exceeding what actuarially determined amounts would have been using a 50-year amortization schedule.” Even in its rebuttal to the claim the mandate was for 75 years, GAO conceded that the payments were in excess of standard metrics regardless of whether they were overly burdensome. The [2012 Postal Reform] bill would provide retirement incentives for nearly 100,000 of the post office’s 547,000 workers. It also would allow the agency to study the elimination of Saturday deliveries if it could not cut costs in the next two years, and it would free up the agency to offer a broader range of revenue sources like delivering beer and wine for retailers. The agency would also recoup more than $11 billion that it had overpaid into one of its pension funds. Perhaps most significant, the bill would restructure the payments the agency makes into a health benefits fund for future retirees. Under a 2006 law, the agency has to pay $5.5 billion annually into the fund, which the Postal Service said had added $20 billion in debt to its balance sheet since 2007. The bill would lower the amount of the prepayments and allow the agency to stretch them out over 40 years. The Postal Service is the only federal agency that prepays its future retiree health obligations. In actuality, USPS faced myriad challenges to its fiscal health, and the text of the law did not explicitly mention a term of 75 years. However, it did mention steep pre-payments for retiree benefits through 2056, an operating cost unique to the Postal Service. Without that unusual mandate and its fiscal burden placed on USPS, its profitability would be viewed far differently in many contexts. Although the 75-year mandate did not appear in the text of PAEA, the year 2056 did — and in many cases, large payments made to meet the mandate would strongly affect USPS’s ledgers. The specifics of the meme were slightly inaccurate and oversimplified, but the overall claims it made — that pre-funded pensions were in effect creating an appearance of greater distress for USPS — were accurate. Casey: The most insane law by Congress, ever? Is This a Picture of Covington Catholic Students in Blackface Harassing a Basketball Player?